As the endgame of Lance Armstrong’s fall develops let’s remember that as well as a former hero he is a man. As the endgame of Lance Armstrong’s fall develops let’s remember that as well as a former hero he is a man; son of a teenage single-mother, a professional athlete – in the infant sport of triathlon – from his teens. Remember also the pathetic fate of his baldy-headed, jug-eared rival ‘Elephantino’. Don’t consider these people to be super-human. The beauty of their achievement rests on the fact that they have only two arms, two legs and two lungs, one heart and one brain. They are people like us. They are not super-humans, and they don’t become evil incarnate when it turns out they crossed an arbitrary line. Dishonesty and hypocrisy are deplorable, compassion and empathy, virtues. Lance and Sheryl met at a charity dinner in 2003. Sheryl Crow is ten years older than Lance. He was the winningest professional bike racer in the World, she a big-time rock’n’roll singer. It’s reported Sheryl suggested they go on a bike ride. ‘The coffee grinder’ managed the request well enough that their romance lasted for three years. The ability to ride a bike very fast is useful when you’re in a race or some other big hurry; for example rushing to catch a ferryboat. The ability to ride very fast is instructive for slower riders, as it is very likely to be – in part – the product of efficiency. Economy of effort is a target, an object worthy of study for all. Make it look easy, or – at the very least – no harder than you want it to be. Efficiency can be used to arrive at the opera-house with every eye-lash, every grain of foundation, in perfect order, or to cover 40 kilometres in 55 minutes and pass the timekeeper with a beard of drool and snot; both are manifestations of control. 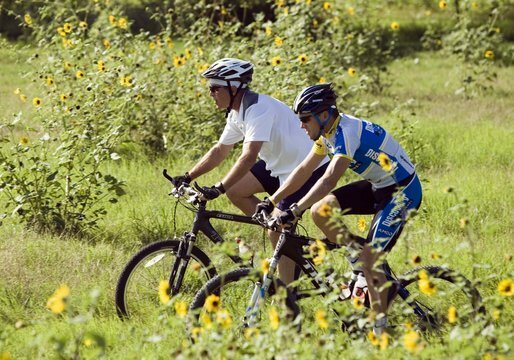 Many hard-riding, performance cyclists eschew ‘junk miles‘, a habit they carry into retirement. Does Ivan Basso ride with his wife? Did Jan Ullrich ever undertake a courtship by acting as amateur reiseführer? For me L.A.’s greatest achievement – the sign he really has some idea how to ride a bike – is his proven ability to ride slowly. Although, to be fair, some of his chosen leisure riding partners have been more than somewhat questionable. Author Patrick FieldPosted on August 26, 2012 Leave a comment on Armstrong’s greatest achievement? Own the city any way you can with this brand-new concept in urban mobility. Designed for speed and easy access, the EASTPAK Velow Collection lets you grab, stash and carry your stuff however you choose to get around. On the road: a stack of high-visibility features make this the bag to be seen with. Underground: the integrated metro card holder lets you tag on and off without even lifting a finger. …but for that to be practical, at least one of the wheels needs to be preposterously big, to eat up the bumps. 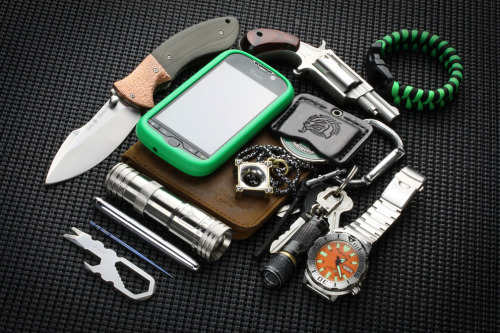 Handbags may be a stereotypically female accessory but really obsessing about what exactly you need to carry is more of a bloke thing; check – for example – Everyday-carry a US-based site where guys compare their penknives and wristwatches. I understand the term ‘guy’ can be gender-neutral in the USA, but guess they’re mostly men? Maybe it’s because worrying about whether your watch-strap matches your wallet, or the precise make and model of your cigarette-lighter is quite gay – that’s ‘gay’ in the ‘theatrical’ sense nothing to do with sexuality – that an alarming number of the featured pocket-dumps include knives – clearly meant for more than slicing malt-loaf – and firearms? As in… “I may be a detail-oriented hair-stylist but I have got a pistol”. Eastpak – a noted luggage brand that began by supplying kit to the US military – have moved into the bicycle bag market – they must have been watching – Timbuk2, Crumpler, Chrome, etc. – apparently people use courier bags on the bus? Another symptom that we are unvanishing. My dealer passed on an invitation to the launch party – he knows I’ll go to the opening of an envelope – where I was presented with a nice example in butch shades of black and grey, which makes coordination with shoes and handlebar-tape less of a headache. Like most Eastpak products it comes with a thirty year warranty which – at my time of life – is a lifetime guarantee. Two loops on the flap are meant for red lights but I channelled the roughty-toughty aesthetic by hanging my Lezyne, Micro Floor Drive HPG on with two Zéfal – Eugène Christophe – toe-straps in white leather. This not only makes me look vaguely like a firefighter, paramedic or security consultant, it also means I’m always carrying two extra toe-straps. Their original function may have been superseded by more practical downhill-ski spin-offs, but toe-straps have more applications than anything made by Gerber, Victorinox or Leatherman. I can also never make the schoolboy-error of going beyond walking distance without a hand-compressor. …you don’t have to worry about luggage security when parking, the bag goes with you. …anything delicate is isolated from road-shock by the rider’s body. …they work well when carrying only a tube, two levers, a little pump and a ‘D’ lock but can also easily accommodate £35 pounds of impulse-purchase groceries. …the Eastpak Velow isn’t really a courier bag. Couriers need – or used to need? – instant access to letters and packages with minimum fuss. The Eastpak Velow has two plastic buckles, and Velcro™, and a zip; not authentic but – unless you’re pushing parcels on piecework – much more practical. The Velow has a pocket in the bottom for an ‘Oyster Card’ which I’d always assumed was something to do with seafood but is, apparently, some kind of bus pass? It is indeed unfortunate that Wiggins was drawn into commenting on the tragic slaughter of Dan Harris. Interpret Wiggins remarks as misplaced professionalism. He was asked a question and gave an answer. Talking to the press is part of his day job. The fact that Wiggins’ remarks are widely reported as if he were an expert on public health is another manifestation of ‘you-cyclists-are-all-the-same’ foolishness which treats people who ride bikes as a homogeneous out-group. Wiggins is not an expert on public heath. Indeed his chosen métier takes him into the elevated area of performance where health and fitness – which normally complement each other well – diverge drastically. People get unnecessarily aerated about crash-hats for utility cycle riders because they don’t want to talk about more important stuff. The main thing about helmets for cycling is that they’re a marginal issue, not that important. It’s usually best to avoid getting drawn into arguments about them and move onto something more significant. It’s a mistake to encourage or discourage an adult to wear – or not wear – a helmet. For adults personal risk assessment is best left to the individual. You can find everything – and probably more – than you need to know clearly and calmly expressed here. This page – in particular – is a useful corrective for people who imagine a helmet will protect them in anything beyond a relatively minor impact. It also stresses the importance of correct adjustment. If a helmet is worn it needs to fit, and be held firmly in the right place otherwise it’s value is only symbolic, which is at best no value, and may increase your risk of injury. It’s true that in Spain national outrage following the running down and death of Ricardo and maiming of Javier, Otxoa led eventually to – lightly enforced – helmet compulsion. In Britain – where bicycle madness has bitten deeper – we who take a professional or amateur interest in public health can use any hysteria over crash hats to rehearse the important truths about who is killing whom. Use the following simile with care – it’s inflammatory – but nonetheless instructive. When a person who doesn’t travel by bike tells somebody that does travel by bike that they ought to wear a crash-hat it’s not at the same level of infamy as people who aren’t Jews telling Jews to wear yellow stars but there is a clear equivalence. Author Patrick FieldPosted on August 3, 2012 Leave a comment on who is killing who? …on Wednesday the very evening of Wiggin’s coronation at Hampton Court – over at Olympopolis on the Lower Lea, a man driving a bus ran over, and slaughtered a man riding a bike. Suburban land-use encourages and enables motor-dependance. It also encourages careless and reckless driving. 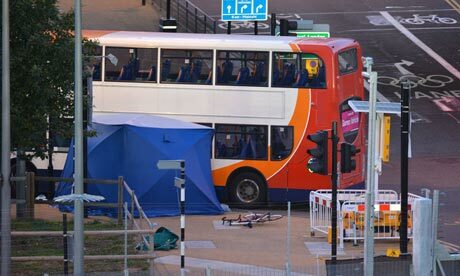 Reports state that the bus – an ‘Olympic bus’ – was ferrying journalists between venues. I expect the passengers were delayed and distracted by their involvement in this terrible systems failure? Maybe it would have been more practical, more reliable to encourage and enable them to travel by bike? Author Patrick FieldPosted on August 2, 2012 Leave a comment on regeneration? 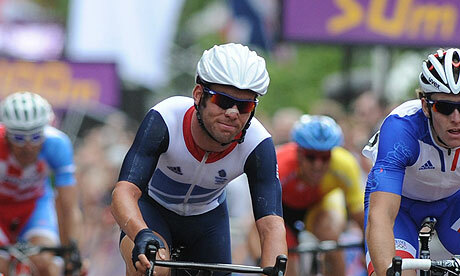 In bicycle road racing favouritism makes it harder to win. To put it another way outsiders have an advantage. Zoetemelk won the World Championship at 38 when the others didn’t take his late attack seriously enough, quickly enough. You can’t chase everyone. Vino – also in his 39th year – won the the Olympic Road Race with a jump on Putney High Street forcing a gap that he held – with the aid of Rigoberto Uran a non-sprinting Colombian – all the way up the Fulham Road, through South Ken and Knightsbridge, down Constitution Hill and along the Mall. Churlish commentary followed Vinokourov’s well-judged, opportunist triumph, complaining about his history of blood-spinning. Suppose the race had regrouped on the run-in and Cavendish had won for the Isle of Man who would have carped about Bernhard Eisel working – not for the glory of Austria – but for his regular teamate? At least Rigoberto Uran – another Murdoch mercenary – didn’t wait to see if he could help. Cycle-sport has no idealised history to draw on. Bike racers had sponsors names on their jerseys, stayed in the best hotels and engaged the best doctors when star soccer players were still travelling to games on the bus, with the crowd. Cycle sport has never been tainted with the Corinthian spirit. Vinokourov isn’t just a throwback to the glory days of Deutsche Telekom, I strongly suspect he will be the last product of the Soviet Union to win an Olympic gold medal in any discipline that makes you sweat, maybe the last of all? Whatever you think about that, or his conviction for hosting somebody else’s blood, it can’t be denied that anyone still racing at the highest level while looking down the barrel of forty years old must really like riding a bike. The warrior deserves his glorious exit.